HMB is an anti-catabolic (anti-breakdown) ingredient, which reduces catabolism of proteins and muscle cells accompanying various kinds of intensive physical activity. Ingestion of HMB increases endurance during training programs involving prolonged muscular stress and helps to achieve optimal results in developing muscular mass. The more the intensity and frequency of the exercise increases, the more important it becomes to ingest this ingredient. 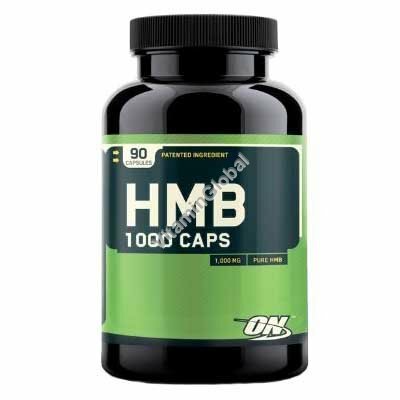 HMB is a metabolite (breakdown product) of the essential amino acid L-leucine - one of the branched-chain amino acids consumed during intensive physical exercise. Under optimal conditions about 5% of the amino acid L-leucine is metabolized to HMB. There are a limited number of nutritional sources for HMB, such as: alfalfa, lemon fruit, meat and catfish, but they contain only relatively small amounts of HMG. The body is capable of synthesizing between 0.3 gram and one gram of HMB per day, dependent on the amount of protein consumed. Therefore, in order to achieve an anti-catabolic effect, dietary supplementation of 3 grams of HMB per day is needed. In contrast to anabolic hormones, which contribute to growth of muscular mass by protein synthesis, HMB acts as an anti-catabolic substance by reducing catabolism of proteins and muscle cells accompanying various kinds of intensive physical activity. Scientific evidence for reduced catabolism as a result of ingesting HMB can be found in its ability to reduce the concentration of the metabolite 3-methylhistidine in urine (a biological marker for muscle catabolism), and to reduce the enzyme levels of CPK (creatine phosphokinase) and LDH (lactase dehydrogenase) in plasma. It seems that HMB is more effective in athletes training intensively than in people training only lightly - as the level of training increases in terms of frequency, scope and intensity, catabolic processes such as breakdown of muscle tissue are intensified, which offsets the anabolic contribution of the training. The anti-catabolic effect of HMB intensifies the anabolic effect, thus helping the athlete to endure the demanding training program, while continuing to achieve positive results in the development of strength and muscle mass. HMB is essential for the optimal production of immune system cells. The recommended daily dose of HMB is 3 gram (1 capsule 3 times daily) with protein-contaning meals. Available in packages of 90 capsules.